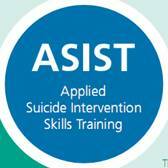 The ASIST 2 day workshop is for individuals who want to feel more comfortable, confident and competent in helping to prevent the immediate risk of suicide. Participants learn and practice skills in identifying and responding to people at immediate risk of suicide. Just as “CPR ” skills make physical first aid possible, training in suicide intervention develops the skills used in suicide first aid. The workshop is for any person in a position of trust. This includes professionals, paraprofessionals and lay people. It is suitable for mental health professionals, nurses, physicians, pharmacist, teachers, counselors, youth workers, police and correctional staff, support staff, clergy, and community volunteers. For more information, contact COI’s Intensive Services Coordinator to schedule a training class for your group at 716-366-3335. Must have at least____class participants to run the class. Check back to see if a training workshop has been scheduled.